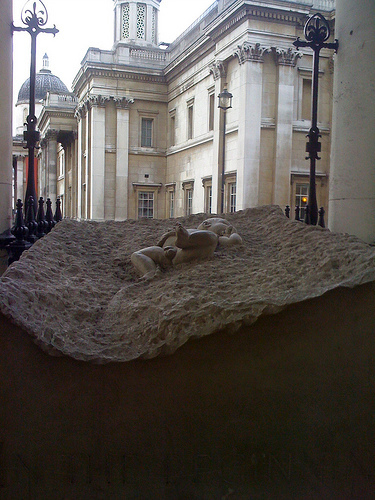 This is a sculpture in the external porchway of St Martin in the Fields church entitled 'In the Beginning' by Mike Chapman. 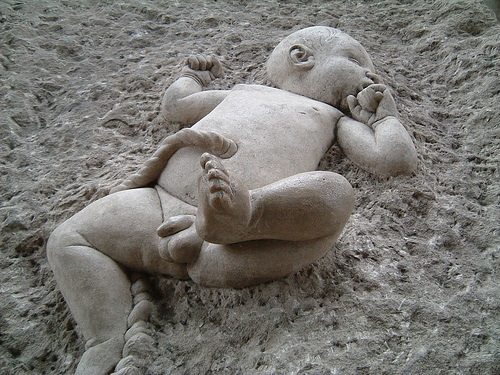 The newborn baby is shown emerging from a large lump of rock, with the umbilical cord disappearing into the rock. There are a couple of steps at the side to help you get high enough up so that you can look down on this sculpture and get a better angle. The inscription says In the beginning was the word and the word became flesh and lived among us. John 1. 14.